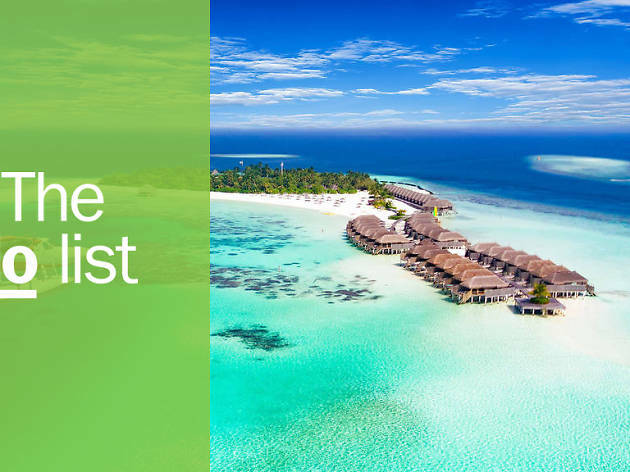 Pristine beaches with velvet sand, coral reefs rich with kaleidoscopic creatures and friendly locals all greet visitors looking for the best things to do in the Maldives. Alive with culture and tradition, this tropical nation in the Indian Ocean comprises approximately 1,200 islands, grouped into atolls. Here, adventure-lovers can swim with whale sharks, parasail across the islands or surf the powerful Huvadhoo Atoll waves. Meanwhile, breathtaking underwater restaurants and spa hotel retreats await those seeking indulgence. What is it? 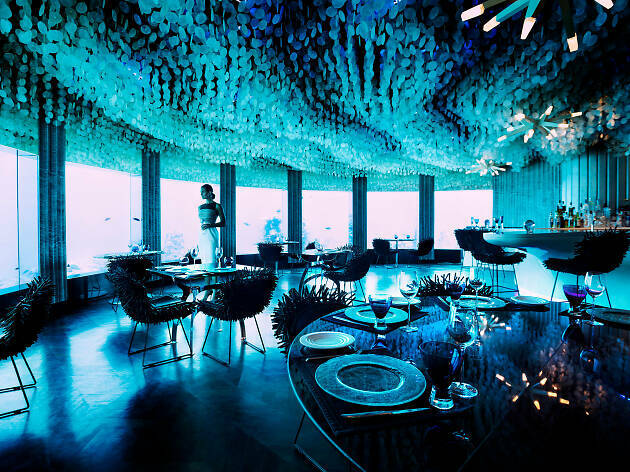 A surreal underwater restaurant located at the luxurious Anantara Kihavah Resort. Why go? To wine and dine at this unforgettable restaurant that lies hidden beneath the ocean’s surface. While you eat Maldivian cuisine, you’ll experience the wonders of the ocean as sharks, turtles and exotic fish pass you by. Perfect for special occasions or a romantic evening, SEA is open for breakfast, lunch and dinner. If you’re a fan of seafood, splash out on the mouth-watering, fresh Maldivian lobster. What is it? A boutique budget accommodation that offers learn-to-surf packages for beginners. Why go? 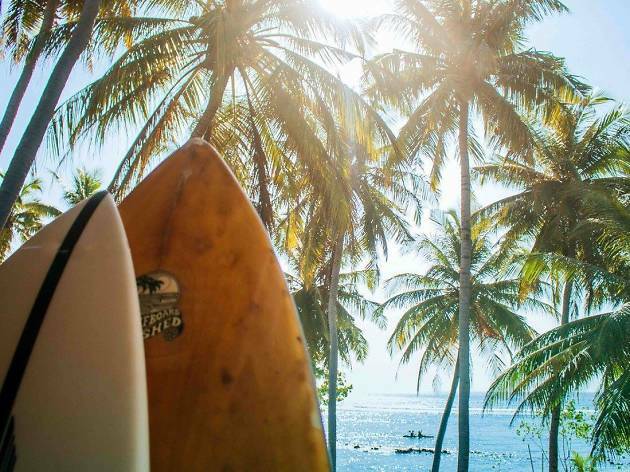 There’s no better place to learn to surf than on the beautiful island of Thulusdhoo. Surf camp packages are available from October to March. Accompanied by the camp’s qualified instructors, guests can take part in daily two hour-long surfing lessons over six action-packed days. After your class, relax on the beach, indulge in a massage, or explore the world beneath the surface with some diving or snorkeling. What is it? A global frontrunner in diving courses catering to all skill levels. Why go? 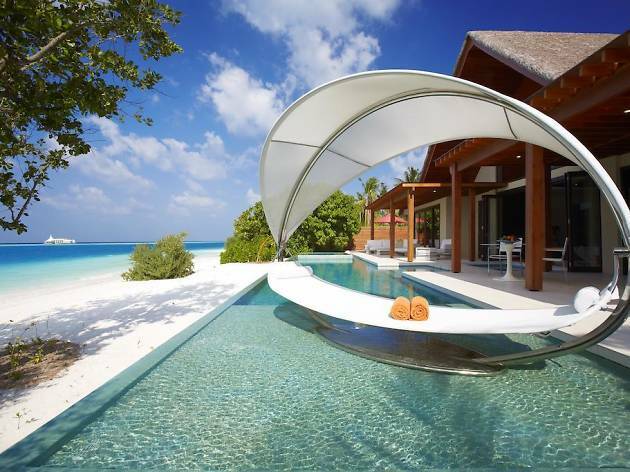 The Maldives is renowned for some of the world’s best reefs and diving destinations. If you’ve always wanted to learn how to scuba dive, or are looking to take your certification to a higher level and dive deeper, a PADI dive course is essential. 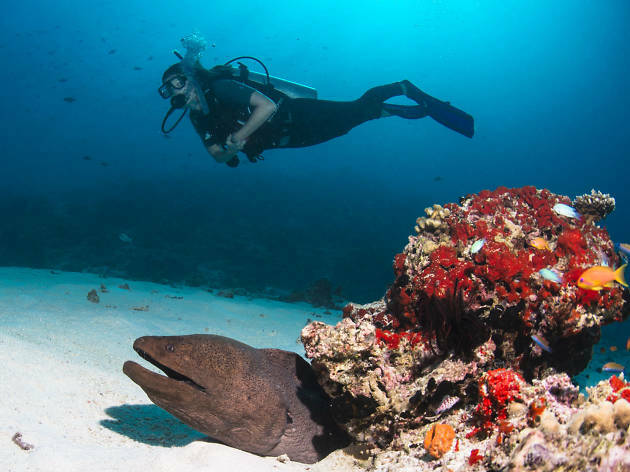 With dive centers located across the Maldives’ many islands, these courses will unlock the wonders of the underwater world. For experienced divers, specialty courses include cavern diving, night diving and digital underwater photography. What is it? 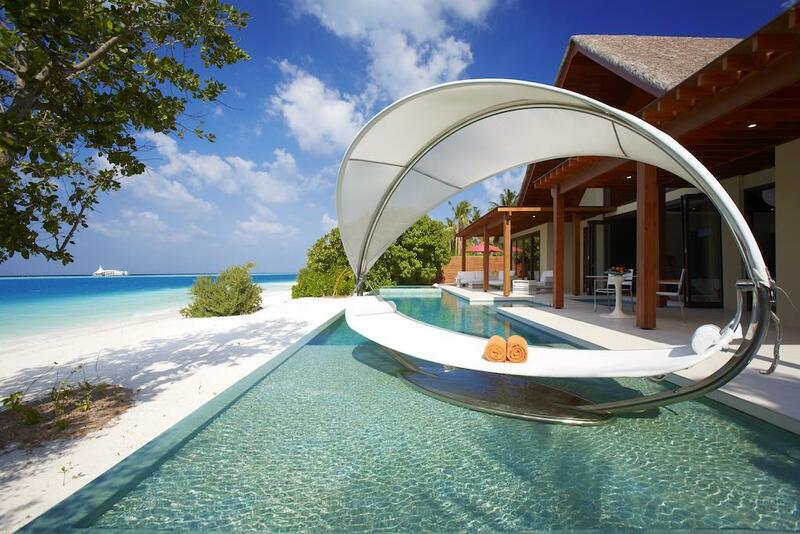 The world’s first and only underwater spa retreat, located at the luxury Huvafen Fushi resort. Why go? Submerged beneath the ocean’s waves, this serene spa transports visitors to a new world of tranquility. Reserved for adults aged 21 and over, it features treatment rooms for both singles and couples. The massages are a masterful blend of ancient traditions and modern techniques, which incorporate the island’s fragrant coconut oil. The spa also offers facials, coolifting and micro needling, as well as hair and nail treatments. What is it? 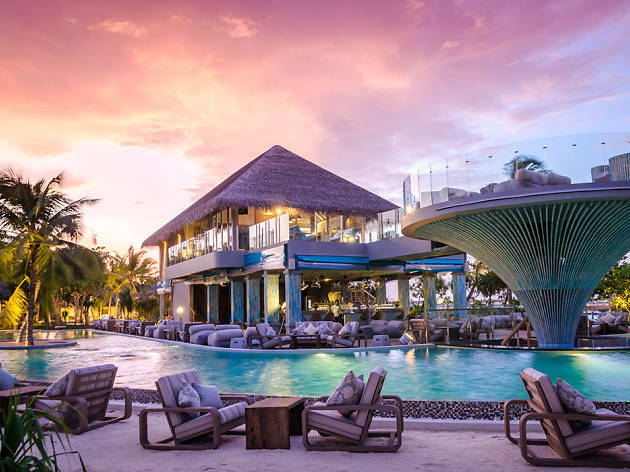 An island resort known for hosting internationally acclaimed DJs, epic parties and A-list celebrity guests. Why go? To relax by day and party by night. After a morning of snorkeling, head to the Fish and Crab Shack for a tasty beachside snack or their famous Tuesday ‘Seafood Extravaganza’. As the sun sets, the 1 Oak Beach Club comes alive with exotic cocktails, acrobats, ‘mermaids’ and stilt-walkers. Additionally, this party haven hosts full moon parties, themed nights and frequent world-class DJ events. What is it? An opportunity to witness turtles hatching on the beach after dark. This magical event usually occurs from May through to September and is available for guests of the Six Senses Laamu to take part in. Why go? 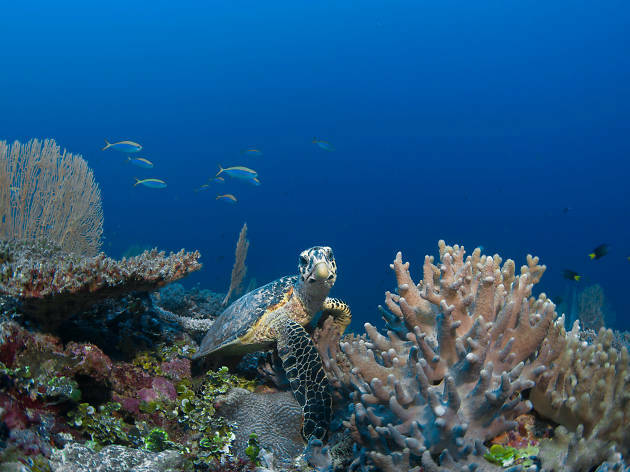 Majestic green and hawksbill sea turtles have made the stunning Laamu Atoll their home. As a result, their eggs are often found on the beaches of the Six Senses Laamu. At this luxury resort, you can witness turtles hatching by night or take part in conservation and rescue. What is it? The world’s first underwater nightclub. Why go? 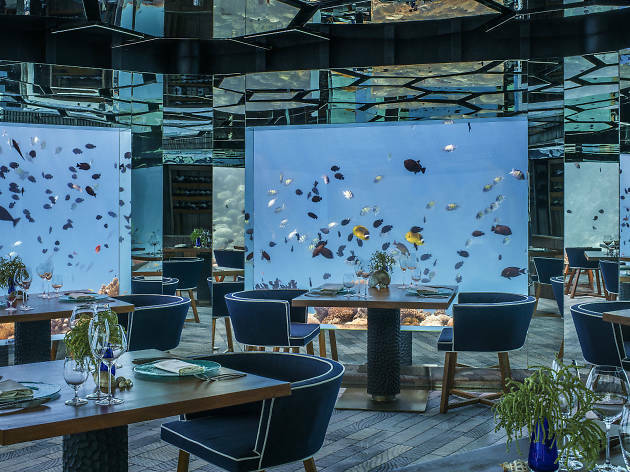 Once you’ve visited the world’s first underwater restaurant at SEA Anantara Kihavah and underwater spa at Huvafen Fushi, complete your trifecta at Niyama’s mesmerizing nightclub beneath the waves. With its Italian chandeliers inspired by coral and anemone-esque seating, you’ll feel truly a part of the ocean. Visit on a Wednesday or Saturday from 9pm to experience its glow party as parrotfish and turtles watch on. This stunning venue is also open daily for Champagne breakfasts, lunches and dinners. What is it? An unforgettable way to cruise through the islands aboard a traditional Dhoni boat. 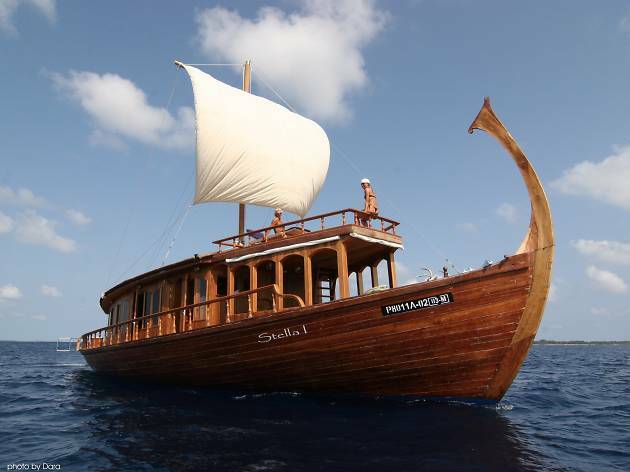 These long sailing vessels, now available for chartered cruises, are created by talented craftspeople and were historically used by Maldivian fishermen. Why go? A Dhoni cruise allows you to make the most of the Maldives by embarking each day to new, exotic destinations and snorkelling spots. Depending on your package, you may visit uninhabited islands, breathtaking reefs, marine reserves and friendly local villages. What is it? 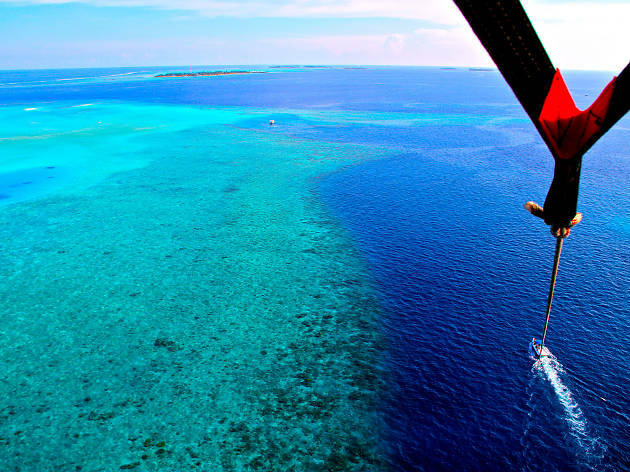 A thrilling experience and opportunity to see the beauty of the Maldives from the sky. Why go? 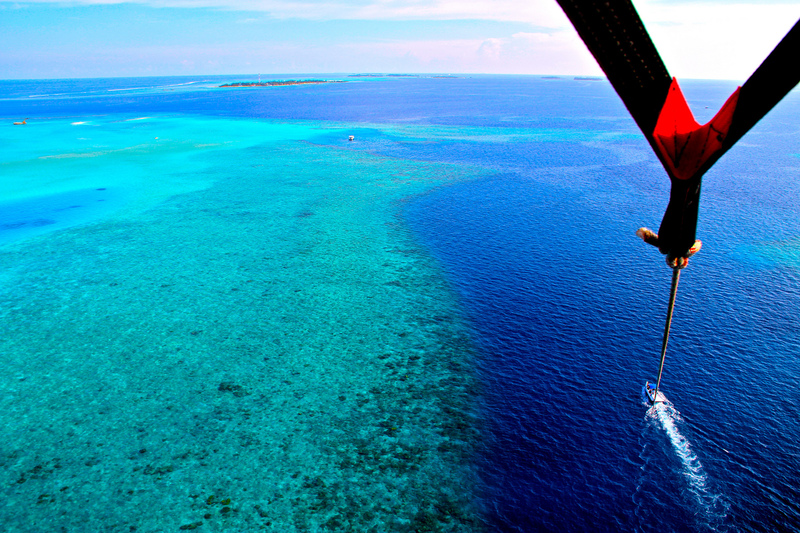 If you’ve never parasailed before, the Maldives is the ultimate place to start. You’ll be led by a speedboat and lifted high into the sky by a parachute – from which point you’ll admire the region’s picture-perfect islands and sparkling reefs. Make sure to bring a camera (and wrist-strap!) so you can capture these breathtaking views. Parasailing is available at most of the major resorts. What is it? 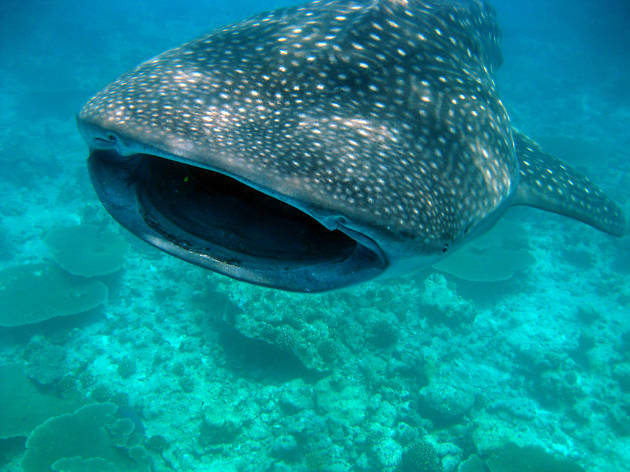 Head down into a world of huge (and harmless) whale sharks in the South Ari Atoll near Sun Island or Rangali Island. Why go? Whether you love a challenge, an adrenaline rush or are simply a lover of marine life, swimming with whale sharks is an experience you won’t soon forget. These magnificent creatures, which usually live for 70 to 100 years, are often found swimming through the warm waters of the South Ari Atoll. What is it? 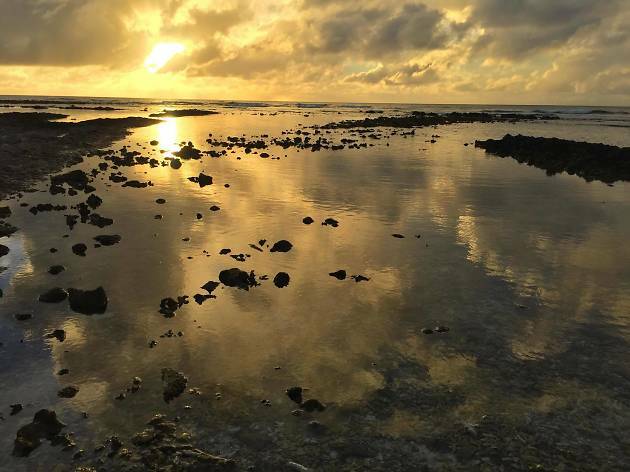 A small, inhabited island in the Baa Atoll known for its artisans. Why go? To experience the culture of the Maldivian people and purchase stunning souvenirs. On this island, many of the locals are skilled at creating beautiful lacquered pieces. Craft shops on the island are generally open from 8:30am to 8pm on Thursdays and Saturdays and from 1.30-8:00pm on Fridays. 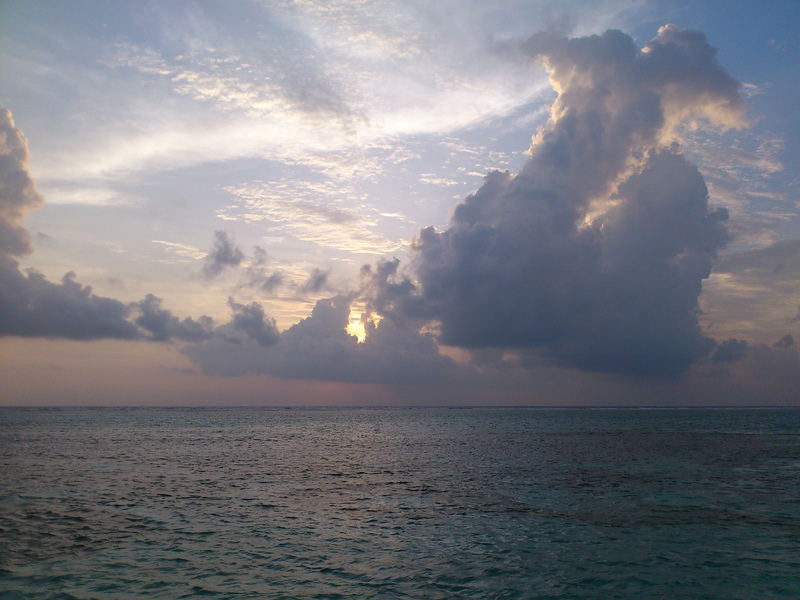 The island may be reached from the capital of Malé by speedboat, ferry or hydroplane. What is it? A quaint, traditional fishing village in the Baa Atoll. Why go? Immerse yourself in the laidback culture of island life on this tiny island that is home to just 600 inhabitants. As one of the oldest islands in the Baa Atoll, this secluded island boasting the Maldives trademark white sand beaches is an idyllic place to relax, snorkel and simply enjoy the tropical climate and culture. 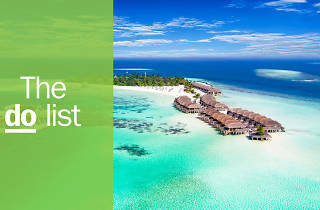 This archipelago of 1000+ islands scattered across the Indian Ocean boasts more than 100 atolls, which are ringed by soft white sand and home to some of the best hotel accommodation on the planet (there are more over-water villas here than you can shake a flip-flop at).